RAPAPORT... Don’t be fooled by the pitch that touts shortage as a reason for investors to plough dollars into the diamond mining sector. In fact, like many other commodities in the world today, the diamond industry is also drowning in a supply glut. What’s worse, amid all the talk of weaker rough sales, is that global production actually grew in the first half and looks set to continue increasing for the rest of 2015. The cumulative output of five major mining companies in the world rose to 47.26 million carats in the six months that ended June 30, an 8 percent jump from a year ago. ALROSA, De Beers, Rio Tinto, Dominion Diamond Corp. and Petra Diamonds account for an estimated 70 percent of global supply volume. Given their respective plans, production is slated to advance 5 percent to more than 50 million carats in the second half, the highest level of half-yearly output since the 2008 financial crisis (see graph). Rapaport Research. Based on data published by ALROSA, De Beers, Anglo American, Rio Tinto, Dominion Diamond Corp. BHP Billiton (former owner of Dominion's Ekati mine), and Petra Diamonds. Certainly, neither the rough nor the polished market has not warranted such volumes in 2015. Demand for rough diamonds slumped to new lows in July as manufacturers cut their purchases of the raw material because of high rough prices and an overhang of polished inventory. Recognizing a weakness in the market, De Beers allowed sightholders to defer up to 75 percent of their allocated supply through the rest of the contract year, while ALROSA made similar concessions for its clients to defer half of their allocations in July and August. De Beers also lowered its prices by about 10 percent at the August sight, influencing some sightholders to ask for already deferred goods to be brought forward. The sight closed with an estimated value of around $300 million, compared with an initial projection of $250 million. Dealers at the event reiterated that demand from the U.S. is supporting the market as China, and, to a lesser extent India, has slowed. Furthermore, the outlook for China has been trimmed thus reducing the longer-term growth prospects for the industry and extending the surplus. Des Kilalea, an analyst with RBC Capital Markets, expects the market to remain in surplus at least until 2018. He said that liquidity levels and falling diamond prices should help lift demand and narrow the surplus. But Kilalea also stressed that the production decisions of the major mining companies will have an influence. 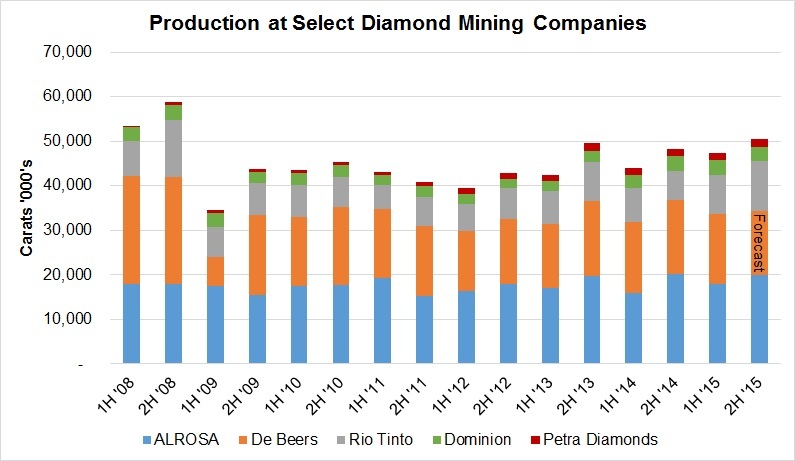 In light of the weaker market, De Beers is the only one among the five companies to have scaled down its production plan for this year from 32 million to 34 million carats projected in January to between 29 million and 31 million carats currently. Paul Rowley, the head of global sightholder sales at De Beers, told Rapaport News the diamond miner has no plans to further cut its production, though it continues to monitor the market closely. So why haven’t the other companies adjusted their production accordingly? Perhaps most tellingly, ALROSA CFO Igor Kulichik said during a conference call on Tuesday the Russian company would prefer to raise inventory rather than lower output as the cost of adjusting operations is high. Already, he reported, ALROSA’s inventory jumped from 14 million carats at the beginning of the year to 17 million carats at the end of the first half. While the company reiterated its production forecast for 38 million carats in 2015, he added inventory will quite possibly increase further by year-end. Indeed, the Russian treasury has its own constraints in 2015, after the ruble depreciated 76 percent in the past 12 months as oil prices slumped, driving a big hole in the state budget. It’s also worth noting that ALROSA sold 18 million carats in the first half, which is the same volume as its production, despite a 21 percent surge in inventory. Similarly, Petra Diamonds sold 1.77 million carats versus a production of 1.58 million carats in the six months to June. Even as Petra marches toward an annual target of 5 million carats in 2019, a company spokesperson pointed out the company’s volume is not big enough to influence global market conditions. A representative from Dominion declined to comment for this report as the company is in a quiet period before its earnings release next week. Rio Tinto, meanwhile, is on track to produce 20 million carats in 2015, a 44 percent surge over last year, with the bulk of the increase coming from its Argyle mine in Australia. Kilalea said the increased supply in the market from Argyle might compensate for reduced production from Zimbabwe’s Marange fields, with its similar types of lower-quality diamonds. Production in Zimbabwe nosedived 55 percent to 4.77 million carats in 2014, according to data published by the Kimberley Process Certification Scheme, and is expected to fall further this year. A spokesperson for Rio Tinto noted that the company’s Argyle and Diavik mines are fully underground operations that cannot be modulated. Indeed, the build-up of inventory may well be a cost consideration rather than a market-related one. Mining companies may also want to maintain production levels while prevailing production costs are relatively low, with energy prices below $50 a barrel and currencies such as the Russian ruble, South African rand and Canadian dollar trading near record lows. De Beers reported that its unit costs in the first half of 2015 declined by 10 percent compared to the same period a year earlier. That sheds some light on why production will continue to rise in 2015, and will not slow down in the coming years. In addition to the major companies’ production plans, a number of new mines are coming on stream, further adding to the oversupply. Lukoil’s Grib mine was launched in 2014 and is ramping up output toward full capacity, as is Gem Diamonds’ Ghaghoo mine which opened a year ago. The high-volume Gahcho Kué mine, a joint venture between De Beers and Mountain Province, is scheduled to come on stream next year, while Stornoway Diamonds said its Renard mine will be ready for production in 2017. That’s an addition of more than 11 million carats a year to the supply mix from the four mines at full capacity. As those projects come on stream and older mines scale down, De Beers and Bain & Company predicted in separate reports that global production would gradually slip from 2020, after peaking around 2018. That may be so, but there will likely be a larger volume of rough available for sale well beyond those dates as the mining companies accumulate inventory. That leaves one of two possible scenarios for the rest of the market in the coming years. Diamond miners can either sell those excess goods at reduced prices - after all, every product can be sold at a price - or they can hold back those diamonds and release them gradually when demand supports the mining companies’ preferred price. That second scenario puts their strategies of the past few months into perspective. Even as rough prices corrected by about 10 percent in August, they’re unlikely to drop drastically again this year despite lingering frustrations at manufacturers’ low profits. As the miners prefer to hold diamonds in their vaults rather than underground, they’re clearly willing to reduce supply and wait out the market for better prices. Therefore, as the overhang of polished is slowly diminished, mining companies’ rough inventories are willingly rising. Perhaps that will enable them to sell the illusion to investors that demand does indeed outpace supply in the medium-to-long term. The writer can be contacted at avi@diamonds.net. Follow Avi on Twitter: @AviKrawitz and on LinkedIn.